Remember when I was loving all things confetti? Doing my confetti manicure and wrapping my presents in confetti? OK so I've moved on from that and now I'm kind of on a glitter kick. Glitter just makes everything so messy sparkly! These are some of my favorite DIY glitter crafts right now. You can find the full tutorials by clicking on each link. holy moly - the glitter pumpkin candle just might bring out my crafty side (it's in there somewhere, right?) love all the sparkles - perfect for the upcoming holiday season! Yes! I am so loving all things glitter right now! Definitely going to try a couple of these projects out! LOVE glitter!! deff trying the candles and the magnets to put on my fridge!! My daughter has loved all things glittery and sparkly since the day she was born...and my husband has, much to his dimsay, gone to work many a time only to be told that he was sporting some glitter! 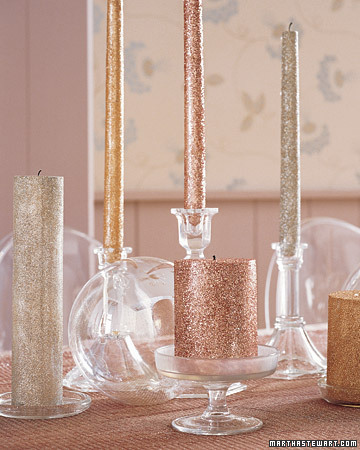 I really like the glitter votives! very nice! so i did a confetti pedicure on sunday! :) though of you! Those are so awesome! I love the votives! Oooh love that pumpkin and perfect for fall too! 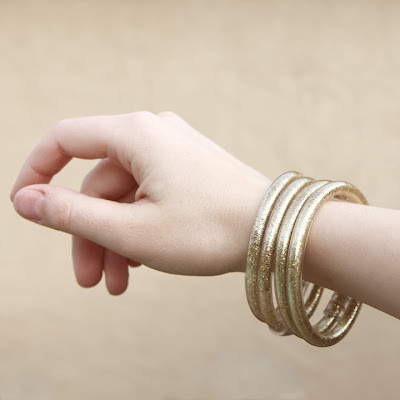 i love a little bling! such fun ideas! looking at these made me feel so girly...love the heels! I think I'm in love with the glitter magnets. So simple and so fantastic! I love the look of all of the photos you chose. I just can't stand the glitter mess while I make things with it. I get glitter everywhere, mostly on my face and in my hair somehow. Fun!!!! I heart glitter. Love the glitter baby jars! Too cute! i love all of those glitter decorations, definitely going to have to try a few of those for this upcoming holiday season, thanks for sharing these today really great stuff! You and I are on the same page today!! I posted about all things glitter today too! Love it! Have to make those glitter magnets...So cute! i want the pumps!! and the pumpkin!! yay for glitter - super cute crafts. Isn't life so much better with glitter? I have the pumpkin on my to do list for our halloween party! so many fun glittery crafts sprouting up around the web! I haven't used glitter in such a long time...I sort of forgot about it! these idea are so cute, thanks for the inspiration! 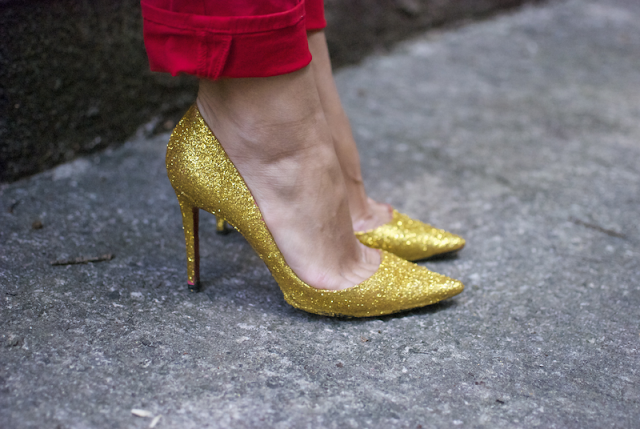 I'm lovin' those glitter pumps! Dang, I was going to glitter a pumpkin - why are all the good ideas taken, lol? :) I'm loving glitter too - glitters shoes are by far the best! Omgosh I just love the top candles in the jars!! Very great blog, thanks for stopping by mine :) - Unfortunately my west elm dreams will have to wait until they open a store near me! those votives are so pretty!